BEIJING, China (CNN) -- The United States said Thursday it was "deeply disturbed" over well-known Chinese dissident Liu Xiaobo's arrest for alleged subversive activities and pressed for his release. 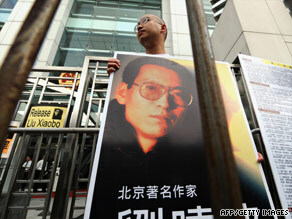 Pro-democracy protesters in Hong Kong demonstrate over Chinese dissident Liu Xiaobo's arrest Thursday. The former university lecturer and literary critic was arrested this week for alleged agitation activities aimed at subversion of the government, the state-run Xinhua news agency reported Wednesday, citing Beijing's Municipal Public Security Bureau. "The U.S. government is deeply disturbed by reports that Liu Xiaobo has been formally arrested and charged with serious crimes," said Richard Buangan, deputy spokesman at the U.S. Embassy in Beijing. "We call on the government of China to release Mr. Liu and respect the rights of all Chinese citizens who peacefully express their desire for internationally recognized freedoms." He was arrested Tuesday, a police statement printed by Xinhua said. "Liu has been engaged in agitation activities, such as spreading of rumors and defaming of the government, aimed at subversion of the state and overthrowing the socialism system in recent years," the statement said. The statement also said Liu had confessed to the charge during a preliminary police investigation. Liu has had other run-ins with law enforcement in China in the past. He served as an adviser to student leaders during the demonstrations at Tiananmen Square in 1989. Along with three other intellectuals, he took part in hunger strikes there on June 2 prior to the crackdown to show support for the flagging student protests. CNN's Emily Chang and Jaime FlorCruz contributed to this report.